We’re pleased to announce a new BLISTER series, 20 QUESTIONS. We’ll be talking with some of the most interesting people in the mountain sports industries, and providing a space for them to offer up more than the just sound bite replies. Scott Andrus, founder and president of ON3P skis (see our recent profile), is up first, and he has set the bar high for the series. 1) BLISTER: First things first: the name, ON3P. I talk to people all the time—even people who love your skis—and there is still confusion about how to pronounce ON3P. So please, settle this, once and for all: is it 3 syllables: ohn-three-pea, or is it 4 syllables: O-N-3-P? Or have you just given up and stopped caring? Scott: Four syllables: O-N-3-P. I care, to a point, but after awhile, there is only so much you can do. It only bothers me when someone is terribly off, like saying it as “Open,” which I have heard before…. 2) BLISTER: You used to just ski for fun. Now, however, you build skis, and for the time being, at least, you spend more time building than skiing. How do you feel about that trade off? Scott: Honestly, I’m completely fine with it. I love what I do and cannot imagine doing anything else. The past few years, particularly our first season, were tough as far as skiing goes. I think I skied 5 days in the 2009/2010 season (our first year). Last year, I didn’t really ski until the middle of February, but beyond that, I never missed a powder day (excluding weekends, as I never ski weekends). Going forward we should be able to ski whenever it is good. 3) BLISTER: What was your home mountain growing up, and where do you get most of your skiing in these days? Scott: I grew up skiing Beaver Creek, but as I got older, started spending more and more time at Vail. These days, I’m at Meadows and Skibowl. We try to only ski midweek powder days, so we basically get two powder openings. Skibowl opens at 3pm, Monday and Tuesday, and 1pm, Wednesday and Thursday, so we ski Meadows from 9 until whenever it is time to pack up and make our way over to Skibowl. Then we hit Skibowl until it is totally worked, then head back to Portland. 4) BLISTER: How difficult is consistency in the manufacturing process? How easy or hard is it to get 100 or 200 skis to turn out exactly the same, with respect to flex, camber, etc. Scott: When you are developing and creating a manufacturing process from scratch, and either doing the work yourself or training new people to do the work, consistency is never easy. It has taken us awhile to get to a point that I am happy with our consistency. The learning curve to get to that point was both frustrating and expensive. But we’ve worked extremely hard to develop and standardize our process and we are getting better and better. 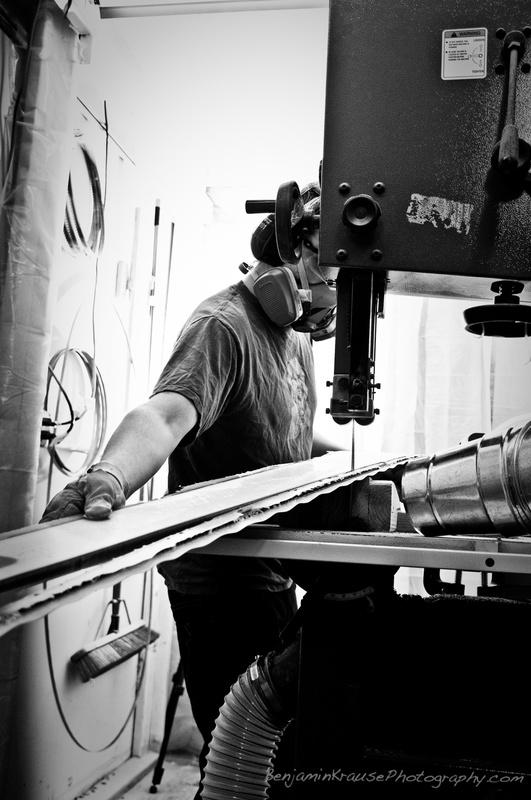 We’ve dramatically improved the quality of our skis each year we’ve been building them. And I expect to continue to improve our skis in the years to come. As of now, the hardest aspect of creating consistency is in the work that is not done in-house. We’ve yet to bring 100% of production in house, so the biggest issues we run usually revolve around suppliers or work we contract out. It has been very, very difficult to find good businesses to outsource some of our processes to. The goal is to bring as much production in house as we can these next few years, and the sooner, the better. At least at that point, any mistakes in production would truly be ours. 5) BLISTER: What’s the biggest thing that you are doing differently in this third production season? Scott: I think the biggest difference for our third production cycle is that we have an established and tested production process. When we first started in our first year, we had built a fair number of skis, but we had no true production experience. Building skis for fun vs. building in production is entirely different. We are still working on and developing our production process, but this third production cycle is markedly improved compared to our production the past two years. We finally have enough experience to know what works and what doesn’t, how to design a functional and efficient ski factory (though limited in available space), and have enough people who are trained and efficient at what they do. We actually have a production line now. ON3P’s Rowen Tych, on the band saw. When we started production in 2009, we had never ground a pair of skis. Now I have multiple people who can design skis, prep materials, and process and finish skis. The hours are still long, but we’ve been making constant improvements, so compared to where we were a few years ago, things are moving fairly smoothly now.